So pretty! It looks like a little stained glass work of art. Thanks for joining us at Freshly Made Sketches this week! Very cool-- love this looks of this! Beautiful!! Love the color combo with the black card stock, Maureen! 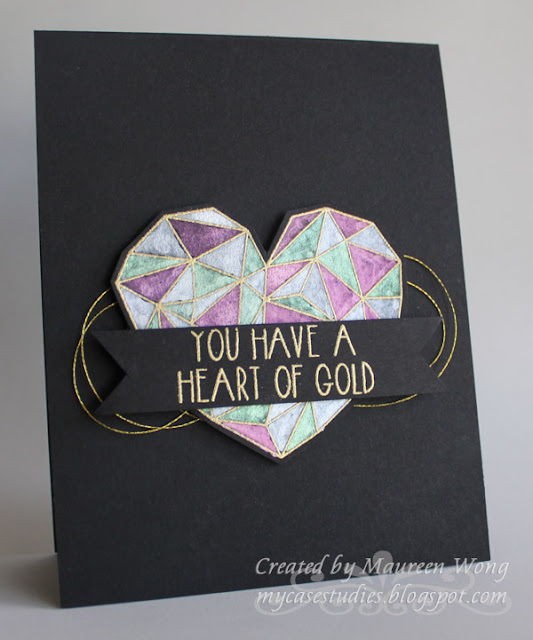 Thanks so much for playing Simon Says Stamp Wednesday “Have a Heart” Challenge! beautiful watercoloring..this card is gorgeous.. thanks for joining us at the Little Tangles Challenge. The pearl coloring is amazing. What a stunning card! Glad you joined us this week at FMS! This is awesome!! Thanks for joining us at Little Tangles! Gorgeous colors on the heart and so striking against the dark background! Oh, its heart warmingly beautiful!! The pearl colors look simply lovely!